Are you in need of durable and stylish new waterproof flooring in Santee, CA? Visit our flooring showroom to discover a full variety of waterproof luxury vinyl flooring, carpeting, and other types of water-resistant floors. Shop with us and peruse our collections of sophisticated and sleek-looking waterproof vinyl flooring and comfortable and neutral carpeting that can stand up to virtually any level of foot traffic. Our showroom is staffed by a full team of experienced and knowledgeable flooring professionals who are ready to help you find the perfect style of waterproof carpet or vinyl flooring to suit your needs. We carry a full selection of floors by leading manufacturers such as Tigressa that are suitable for all rooms and price ranges. It’s important to have a stylish floor that suits your home and personality, but durability and longevity should also be factored into your decision. Our flooring showroom carries a full variety of attractive waterproof options suitable for the kitchen, dining room, bedrooms, home office, bathroom, laundry room, and any other room in your home. With our waterproof vinyl flooring styles, you can enjoy the durability and waterproof quality of vinyl flooring with the style and appearance of any material. Whether you prefer the look of hardwood, marble, ceramic, granite, or natural stone, we’re sure to carry a waterproof vinyl style that suits your tastes. You can choose a flooring style to match your existing furniture and décor or redesign your entire décor scheme to suit the floors of your dreams. Our staff is always on hand to discuss interior design and help you find the perfect floors. 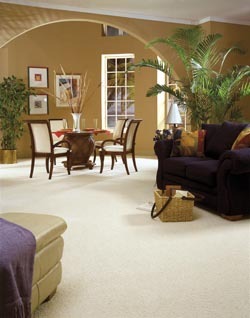 Carpet flooring provides comfort, style, and durability that last for many long years. Waterproof carpet flooring is an ideal choice for bedrooms, living areas, dining areas, and other common areas where people like to relax and spend time together. While comfort is an important part of any room, it’s also important to ensure the safety of your environment and the quality of your flooring materials. Our carpets that are waterproof are designed with special fibers that repel and resist water, spills, stains, and premature wear. This makes them the perfect choice not only for homeowners looking for protection from water damage, but also for families with children, pets, or high levels of foot traffic. Waterproof carpeting is sure to resist most types of damage for many years. Contact us when you’re looking for an extensive selection of waterproof flooring. We’re proud to serve clients in the Santee, California, area.